You could tie a string around your finger, but it’s easier to have QuickBooks 2015 remind you to pay your bills on time. In fact, you can make the Reminders message box the first thing that you see when you start QuickBooks. To adjust the QuickBooks reminder options, you must be logged on as the administrator in single-user mode. Then choose Edit→Preferences. 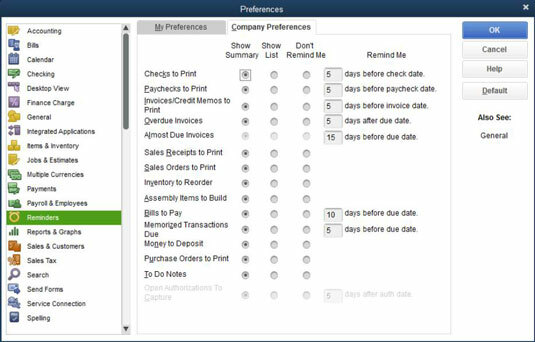 When QuickBooks displays the Preferences dialog box, click the Reminders icon from the list on the left and then click the Company Preferences tab to access the dialog box. Make sure that its Show Summary or Show List option button is selected and then give yourself several days’ notice before you need to pay bills by typing a number (10 is the default and usually works well) in the Days Before Due Date text box, located in the Remind Me column. If you select the Show Summary option (the first button to the right of the option), you get a summary of the bills that you owe each time you start QuickBooks. If you select Show List (the second button to the right of the option), you get the details about each bill. You may want to review the Reminders window when you start QuickBooks or open a new company file. The window lists reminders (such as forms you need to print and payments you need to transmit) and tells you which unpaid bills you’re supposed to pay. You can see this list by choosing Company→Reminders. You can also tell QuickBooks to display any reminders when opening the company file. To do this, choose the Edit→Preferences command, click Reminders, click My Preferences, and then select the Show Reminders List when Opening a Company File check box.